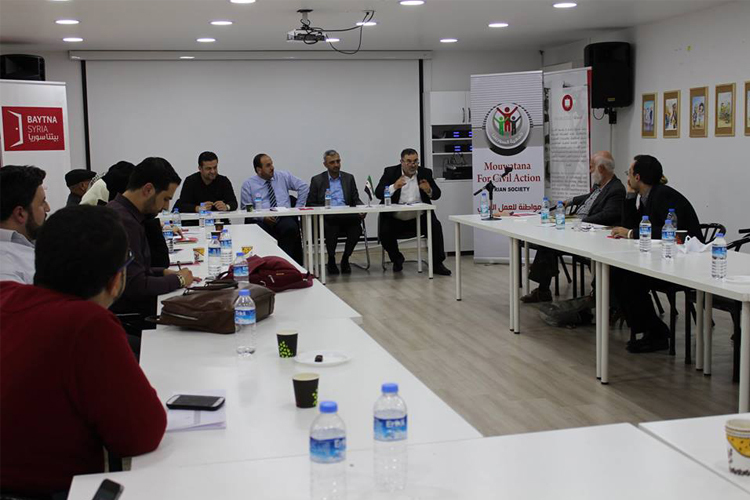 Mouwatana for civil action has invited Jusoor for training, which participated by the executive manager, Mr.Samer Khayat in a discussion seminar held in” Baytuna Souria hall" in Gaziantep , October ,11, 2016, which comes within the activities of (Mousharka Forum) launched by Mouatna . This seminar was held by attendance of the secretary general of the national coalition Mr. Abdulillah Fahed, member of the political commission , Dr. Nasr Al-Hariri , members of coalition Mr. Salah Al-Hamwi and Dr. Jalal Al-Deen khanji , director of support coordination unit (ACU ) Dr. Mohammed Hasno ,in addition to a group of civil society organization and a number of businessmen and university students. the discussion in this session centered on education problems, political empowerment for young, ways of activating their role in the society and their participation in making community solutions. In addition to raising some questions about the possibility of empowering academic staff to bring youth to the labor market, and some problems of youth in Turkey. We thank all those who attended and helped to success this activity, special thanks for Mouwatana for civil active for their invitation , and we recommend follow up to support and empower youth , which Jusoor considered them as its first priority .